From left are: front row, Lauren Krause, Lauren Ames, Nicole Walt; back row, Drake Mallard, Hanna Duncan, McKinis Beam, Reilly Hopkins, and Southern Ohio ESC Superintendent Tony Long. 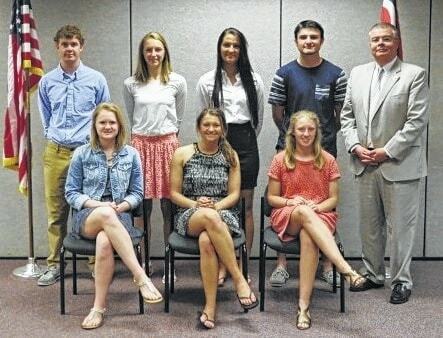 WILMINGTON—The Clinton County Business Advisory Council (BAC) awarded its Integrity Scholarship to seven area graduating seniors who demonstrate academic promise, ethics, and ambition. Established in 1998 as a way to make the cost of post-secondary education more affordable, the BAC has since awarded 117 graduates scholarships totaling over $53,000. This year’s recipients were each awarded $500 scholarships. Graduating from Blanchester High School is Reilly Hopkins who plans to attend University of Cincinnati Clermont where he will study liberal arts. Graduating from Clinton-Massie High School is Hanna Duncan who plans to attend Kent State University where she will major in fashion merchandising. Graduating from Wilmington High School and planning to attend The Ohio State University are Lauren Ames who plans to pursue pre-med studies; McKinis Beam who plans to pursue a career as an orthopedic surgeon; and Nicole Walt who plans to major in finance. Also from Wilmington High School are Lauren Krause who plans to attend Ohio University and is currently undecided upon her major area of study and Drake Mallard who plans to attend Ohio Northern University where he will study economics, accounting, and business. The following Clinton County businesses and community members have made this year’s scholarships possible: Air Transport Services Group, Inc., The Allen Company, American Equipment Service Inc., BDK Feed & Supply, LLC, Bush Auto Place, Clinton Memorial Hospital, Collett Propane Inc., Croghan AutoCare LTD, Curless Printing Company, D & E Equipment, David G. Chestnut, D.D.S., Ferno Washington, Inc., First National Bank, Gates Ford Real Estate, Jody W. Ames DDS, LLC, McCarty Gardens, LLC, McDonalds (Rombach Avenue and Interstate 68 Locations), Morgan Insurance, Naylor’s Furniture, Inc., New Sabina Industries, Inc., Phil & Vicki Snow, R & L Carriers, Inc., Smith-Feike-Minton, Inc., Vital Fitness, Wilmington Iron & Metal Co. The BAC Scholarship Fund is administered by the Clinton County Foundation and the Southern Ohio Educational Service Center. The campaign for the 2016 scholarship drive will begin in October.